One electronically tested 14KT yellow gold ladies cast opal and diamond pendant with chain. 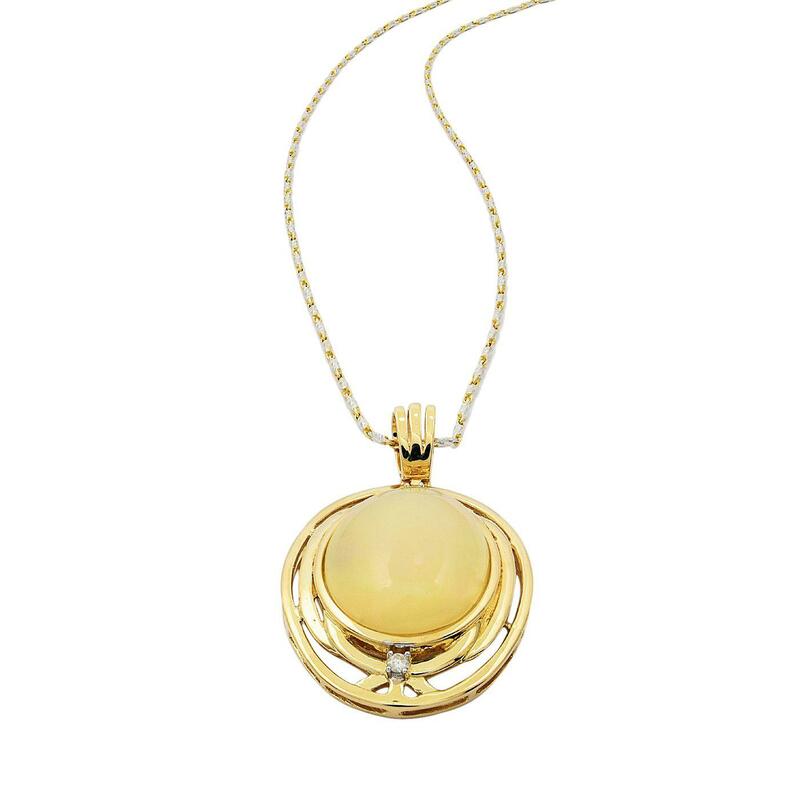 The pendant features an opal cabochon set within a stylized diamond accented lattice bezel, completed by a grooved yellow gold bail. The pendant is supported by a twenty inch length 14KT yellow gold designer style chain with rhodium accents, terminating in a lobster claw clasp. Bright polish finish with rhodium accents. Trademark is A. ISAACS. Identified with markings of "14K". Condition is new, good workmanship. One bezel set oval cabochon cut natural ethiopian opal, measuring 19.80 x 16.00 x 6.00mm, approximate weight of 10.82ct. The opal has a somewhat bright, multicolor play of color (fire) in a flashfire pattern; a medium dome; a good cut; no inclusions; minor dull spot in its brightness and pattern; and is not directional. Graded in the setting. Two prong set round brilliant cut diamonds approximate total weight of 2 Stones = 0.06ct. Graded in the setting.